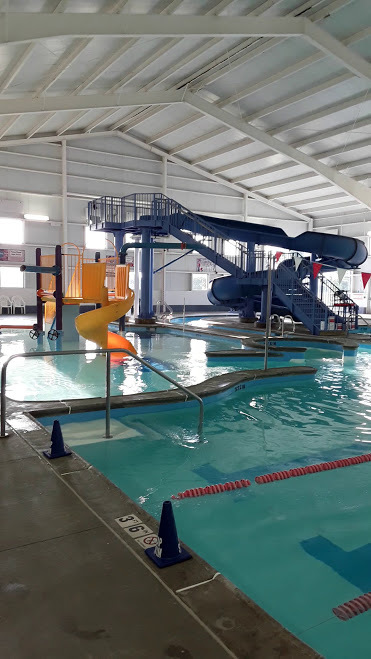 Our tentative Aquatic Center schedules are created + posted weekly for members + non-members alike to see what time would work best for them to utilize our facility. For those not involved in our physical therapy program; appointment times are on Monday, Wednesday + Friday from 8 am – 12 pm. This is when Kyra Havera, TMH physical therapist, will be assisting patients in the lap lane and open pool area. Lap Lane 3 will be reserved for physical therapy when necessary. Our Water Park Features, which includes the Big Blue slide and interactive play area, is open to members and the public every Monday + Wednesday from 5:00pm – 8:30pm, every Friday night from 4:30pm – 8:30pm, and every Saturday and Sunday from 12pm – 4:30pm.